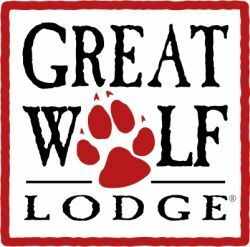 This weekend not only did we get to go to a Ranger game, but we also went to the Great Wolf Lodge. Coach and Honey took us! We had such a great time! Maggie loved it from the very beginning! It took Hunter a little bit to get used to the water, but by the 2nd day he was really into it! Here are a few pictures of Maggie. Really we should have taken pictures a lot earlier. We took these on Monday and she was getting so tired and hungry. They don't show just how happy and how much fun she really did have in the water. Oh well... maybe next time I'll have my camera with me more! Maggie's favorite thing... the slide. She would go down it over and over again! Just playing in the water! She LOVES water! She is our little water baby for sure!!! Here is Hunter-man! On Sunday he was a little scared of the water, but by Monday he was ready to go. He loved going down the slides and playing in the little kids area. He also loved the wave pool with Daddy. He got to where water in his face did not bother him at all! He had such a great time! Here he is going down the twisty blue slide! He loved it! And down the fast yellow slide! Hunter and Honey going outside to play! Maggie was tired and hungry on Monday and so she got out and had some Coach time. She is holding her cute wolf she got. It's a new favorite stuffed animal. Maggie and Hunter about to leave. We had such a great time and want to go back! Next year Hunter will be tall enough to ride more slides and he might even be able to do the magic quest thingy. Thank you Coach and Honey for a great weekend!!! We loved it!